waw ! en español waw egen! Message edited by author 2006-08-31 01:32:20. This is a stunning shot and i really want to try this for my self but could use some help. perhaps you could write your story in the "How'd they do that"
What a wonderfully simple, but very powerful photograph. Well done!!! Congratulations, Arnit, this is beautiful work. I love the yellowish part of her eye, surrounding the pupil, how it's irregular, and all the little dark lines going out from the middle. Beautiful. You always do such great work, Arni, and this is just stunning. Thanks for posting this and congratulations! Message edited by author 2004-04-02 01:04:51. Great shot! Needs a little more digital cleaning in the white area under the eye... the cut out is visible... there should be a smoother transition from transparency to the eye... 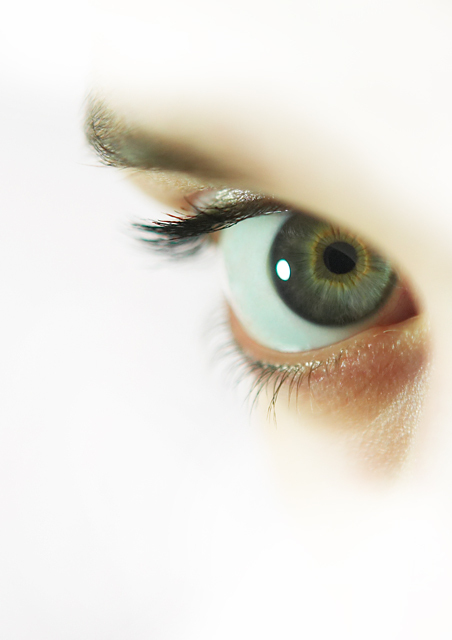 Otherwise absolutely beautiful eye! mehrr lankarr as rida henniii, extremly well done! Congratulations! Message edited by author 2004-03-31 18:28:47. Congrats Arnit, this is one awesome shot! Og það er nú reyndar fullt af fólki sem skilur þessa íslensku! Ef þú notaðir bolinn þá gætum við verið að tala saman. Eru þetta rússneskir stökkdvergar? Ég býð 8 þúsund rúblur og gömlu kódakmyndavélina sem ég fékk í fermingargjöf í allt draslið og málið er dautt! Message edited by author 2004-03-29 11:21:38.
heida: Ég var með 24-70mm F/2.8 linsuna mína. Skaut þessa á 70mm og cropaði smá. I was just answering heida what kind of lense I was using. Thanks again for all those great comments. I'm glad you liked it. Congrats Arnit, another wonderful image. Very creative. Congrats on the win - very striking shot. Congrats on a well deserved ribbon ! I wish you had some details on posted with this one. I love it ! Magnað, hreint út sagt magnað. Til hamingju. I think you are one of the most creative and versatile photographers on this site. I often find after the challenge that an image I have really liked and thought unusual and original was taken by you. Congrats, Arnit, on the blue ribbon. Thanks for all those great comments. And yes this is the same model I often use, Brynja Bjornsdottir. Forgot to put her name in the Photographer's Comments. Well deserved win - awesome, memorable photo. Congrats. I love to be right! YES! Congratulations ~ Well Deserved ! beautiful! congrats on another great shot and ribbon! Great focus, seems unnaturally blurred. Wish the eyebrow was in focus too! Wow, This is an amazing shot... How did you get the fade around the eye? It kind of looks like a hole in a piece of paper that is out of focus? Thouroghly enjoyable photo to look at. I expecialy love the way the Iris eplodes into colors and pattern resembling deep space photos. Perfect ..How did you do this?? i went to the eye magazine website to check out the appropriateness of your excellent entry--pretty cool periodical and wonderful site. your photo, as gorgeous as it is is almost too conventional for it!! anyway, you have a beauty here. great work amazing dof, great light. The best eye shot I have ever seen, if I could give you 11 I would. my only ten so far, very sharp and good dof, lovely colour, love to know how this was done. You did an excellent job on this! I looked at the magazines and found this not to be the typical type of photo that they use yet I;m sure they would be tempted with this! I enjoy seeing post processing that brings out the best in a photo! Terrific image. I love the way you have blended the skin tones into the negative space. Riveting. this is one cool shot. Had never heard of eye magazine (till now). Stunning image, great capture and good post-processing. Hope you do well with it - 9 from me. Beautiful shot, absolutely stunning and superbly done. I had a rake around the net and the only "eye magazine" I could find was a 1960's youth culture mag. Doesnt seem to fit your image? Exceptional! The clarity and composition are noteworthy, and the fade is very well done. Stunning! This is unique and very much ribbon-worthy. Exciting! Good idea, fulfilled in an excellent way! Beautiful and extrordinary composed. Although this is obviously photochopped, the effect is breathtaking. A 10 from me. Proudly hosted by Sargasso Networks. Current Server Time: 04/20/2019 12:59:44 PM EDT.